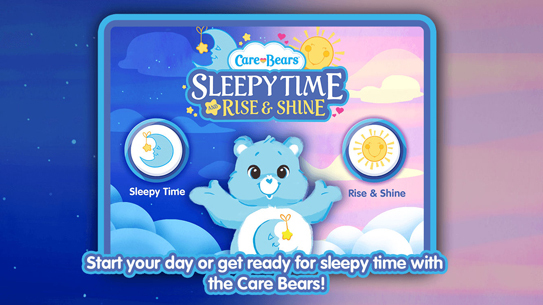 If your little cub loves the CARE BEARS, the new CARE BEARS: SLEEPY TIME RISE AND SHINE activity app is a great new way to help them start and end each day! Watch the NewsWatch Review, then download the app! Kids practice growing up through play and there’s no better way to learn when it’s time to wake up or time to go to bed than having them practice getting the CARE BEARS up or putting them down for the night with this new daily activity app! Loaded with special ‘Good Night’ and ‘Rise and Shine’ activities for each of their favorite Care Bears – 14 in all – your little cub can visit their favorite Care Bears already snuggled up in their beds—Harmony Bear TM, Funshine Bear TM, Share Bear TM, Tenderheart Bear TM, Cheer Bear TM, Wonderheart TM Bear and Grumpy Bear TM—getting them up or putting them to sleep? That’s up to them! The main screen takes you to two different Care-a-Lot worlds: A beautiful twilight ‘SLEEPY TIME’ world that’s just going to sleep or a cheery early morning ‘RISE AND SHINE’ world that’s starting to wake up! 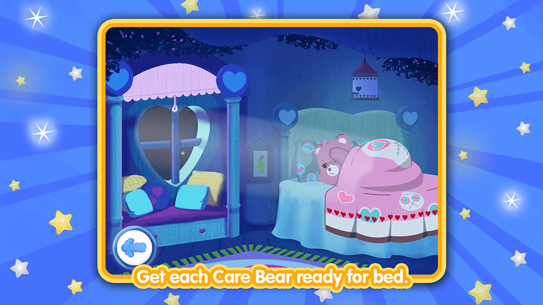 Your cub can decide which Care Bear is going to bed (or getting up) and when! And there’s more! 2 beautiful Good Night and Wake Up songs only available in this app, help reinforce the bedtime and waking up rituals. 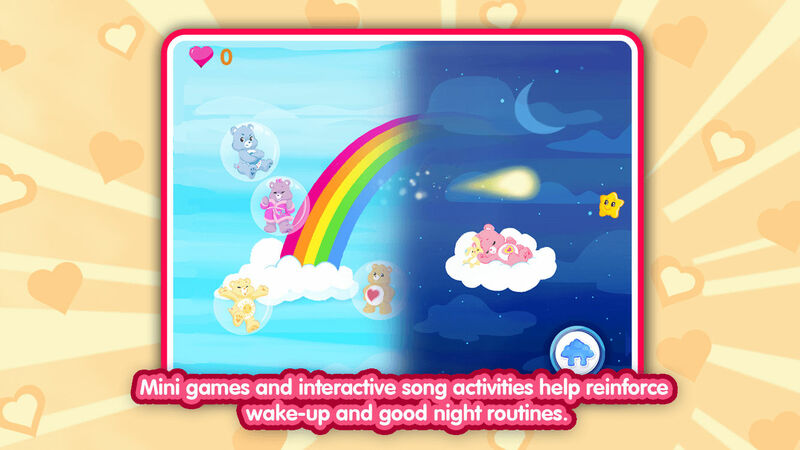 Kids can play a minigame popping bubbles and catching bears on a cloud as they listen to the Wake Up song. Or interacting with their favorite bears who are peacefully sleeping. 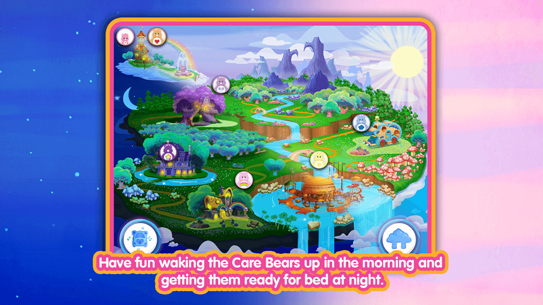 In ‘RISE AND SHINE,’ your cub starts the day visiting each CARE BEAR at home for a special ‘rise and shine’ activity! Chirp with the birds to wake up Harmony Bear! Join Funshine Bear in some Jumping Jacks! Bring Share Bear a hearty breakfast! Help Tenderheart Bear makes his bed! Encourage Cheer Bear with her routine! Let the sun shine in for Wonderheart Bear! Get Grumpy Bear’s latest cuckoo clock invention to work! Rock Harmony Bear to sleep with her favorite lullaby! Count the stars with Funshine Bear! Pull down the shade so Share Bear can go to sleep! And help Grumpy Bear with his blanket! Models healthy morning behavior, like a good breakfast and exercise! Supports good habits—making your bed! A visit to each of the Care Bears home! Interactive elements in every scene! Mini-game! Pop the Bubbles and Catch the Care Bears on the Rainbow Cloud! Mini-game! Interact with the night sky and the Care Bears as they float by on their clouds!